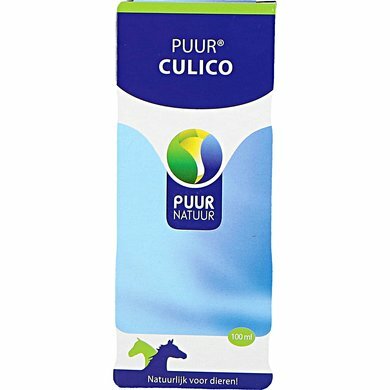 Pure Nature Culico Horse and Pony 100ml. Voorstaart and moons. Makes horse and pony insensitive to the stings of Culicoides Robertii mosquitoes. Diluted extracts of Oats (Avena sativa), Horsetail (Equisetum arvense), Marsh rosemary (Ledum palustre), Arnica (Arnica montana) and Blackcurrant (Ribes nigrum). Alcohol 35% v / v.
Oat (Avena sativa) in case of restlessness, for the skin.Heermoes (Equisetum arvense) for healthy hair, coat and skin. Marsh rosemary (Ledum palustre) is used for the consequences of mosquito bites. Arnica (Arnica montana) gives relief. Black currant (Ribes nigrum) contains flavonoids, anthocyanins, tannins, amino acids and a small percentage of essential oils. Ribes nigrum is one of the most important means of gemmotherapy. In addition, Ribes nigrum possesses diaphoretic properties, increases the functioning of the kidneys and inhibits the release of histamine from mast cells. Because of these properties, excellent Ribes nigrum can be used as a front tail and mane. - Optimal dosage is 1-2x daily administration. - If this is not possible, it is sufficient once a day or 1x per 2 days. Then give the maximum daily dose. - 20 drops is approximately 1ml. Give this product with a plastic syringe directly in the mouth or mouth, possibly diluted with a little water. This product can also be given by the feed or on a small piece of goodies. Always ensure good quality food and limit the absorption of sugar in grass (fructosamine), lump, muesli and extras. If there is no improvement during the treatment or if the symptoms keep repeating, you should consult your veterinarian. 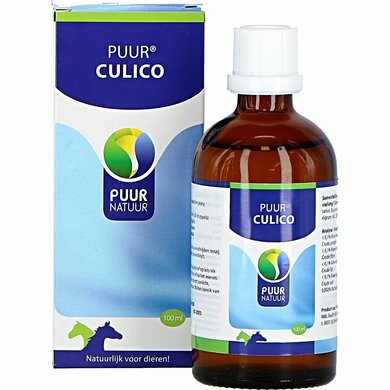 Pure Nature Culico was developed by veterinarians on the basis of data from literature and years of practical experience. The specific combination of ingredients ensures a regulating effect and promotes the natural recovery process. 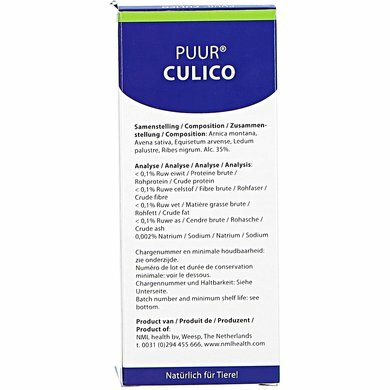 By Puur Natuur Culico the cause of tail and mane eczema is addressed. Usually the drops should be given for two years in a row, during the months of March / April to October / November. In general, they are no longer needed afterwards. It is necessary not to interrupt the treatment between March and November. Experience has shown that much improvement occurs during the first year of administration. In the second year of administration, the effects are even better, at the end of the second season the treatment can often be ended. In times of intensive mosquito infestation, in sweltering warm weather, it is recommended to increase the dose to a maximum of a doubling of the prescribed dose. In periods and times of large mosquito activity, it is also advisable to leave the horse or the pony in the meadows late in the morning and to store them in the evening. The effectiveness of Pure Nature Culico can be increased by at the beginning of administration, also clean internally with Pure Nature Drainage. It is advisable to insert a stop week after every 6 to 8 weeks. Thus, the stimulus can be offered again after the stop week. Resume the treatment immediately if the complaints give cause to do so. Avoid direct sunlight and keep this product dry and at a temperature between 5-20 C. Keep out of reach of children. The expiration date is stated on the label and the box. Synergy and combinations with other products. This product can be used without any problem in combination with other natural health products and regular medicines. Use Pure Nature Culico in combination with Pure Nature Allergy. It is also recommended to give a course of Pure Nature Drainage twice a year, this improves the functioning of the immune system. In addition, Pure Pure Natural Lotion and / or Pure Nature Zinc Sulfur can be used for the affected areas. Always use in consultation with the treating veterinarian during pregnancy and lactation. To date, side effects of this product are not known or reported. With a number of dilutions and extracts, a short-term exacerbation may occur at the start of treatment. This means that the animal reacts to the product. In the event of a severe increase in dosage, halving or temporarily stopping and afterwards gradually build up again. This product contains 100ml in a bottle, with a dropper in a box. Read the package leaflet / instructions on the package before use. Already tried a lot with my Shetlander, I have the idea that this works well in combination with shaving the bangs. Eat everything where I put it. Droplets work great, do not need a syringe. 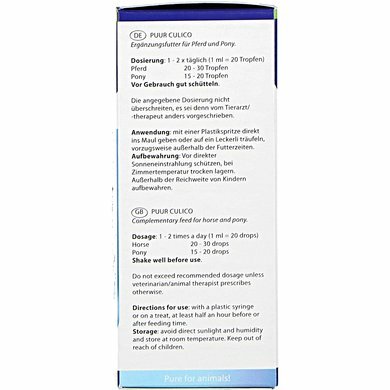 Fine product, works very well with my pony with eczema. Less itching after a couple of weeks. Good product, seems to do something against summer eczema, but pony has also had an eczema blanket on it. If it does not work then it does not seem to me.